Today I'm going to take you on a trip to Italy. Tuscany, to be precise. The Italian regions of Tuscany, Piedmont, Liguria and Emilia-Romagna are very rich in sweet chestnuts. So, ironically, chestnut flour used to be a cheap staple for people there, while today it is one of the fancier and quite expensive naturally gluten free flours which celiacs use. If you ever have tried roasted sweet chestnuts, you know the sweet flavour of the creamy-white flesh. Sweet chestnuts contain very little fat, about the same amount of carbohydrates as wheat and rice, twice as much starch as potatoes and about 8% of various sugars which is the reason for their natural sweetness. You'd expect me to tell you that I ate this cake in Italy one day and fell in love with it, but truth to be told, I never ate it before I actually made this one the other day. I love to write - about food, about science, about nearly everything on the earth that catches my interest. And I love to write fantasy. My favourite hobby (besides eating and drinking coffee) is to write an ongoing story which I started when I was twelve years old and which most probably will continue till I watch the grass from six feet under. The heroine of this story grew up with me and I grew up with her, and as things go, we will get old together and share a place in a retirement home one day. She's my counterpart and represents everything that I'm not; and everything that I can't experience myself - like visiting the Otherworld or San Casciano in Val di Pesa - I experience through her. In one chapter, I went on a trip with her to see Florence, which in reality I haven't seen yet. 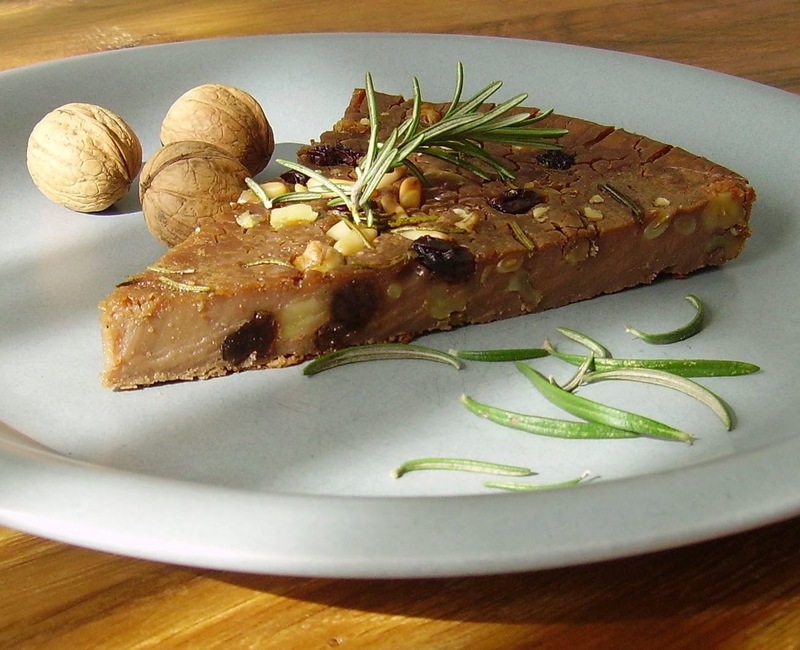 And discovering the Tuscan cuisine, she had this chestnut cake and liked it a lot. My husband, who keeps reading the story as it grows, kept nagging that he wanted to try the cake in real life, so I purchased a bag of chestnut flour and got to work. If you expect your normal piece of cake, you'll be terribly disappointed. Castagnaccio is nothing like any dessert cake I have ever tried, but I did love it. The consistency is slightly gummy, which at first bite might be weird. I'm really picky when it comes to weird food consistencies, but I got used to this after only three bites, and then I just concentrated on the unusual, yet pleasant flavour that exploded on my tongue. 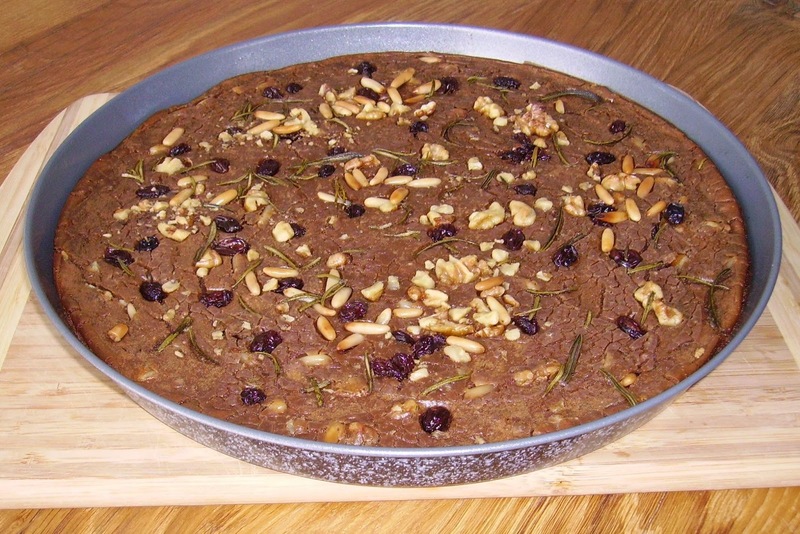 It's not really sweet, because the only sweetness comes from the chestnut flour, which is slightly sweet itself, and the raisins. So you can either eat it with ricotta or a piece of parmesan cheese, if you eat cow's milk produce, or pecorino cheese, which is like parmesan but made from sheep's milk, or you drizzle some good honey over it. Preferably chestnut honey, but any other will do fine, too. Usually, the cake is served with a glass of wine like Beaujolais Nouveau or dessert wine like Vin Santo. If you're open for different flavour experiences and want some real Italian dolce vita in the middle of a busy week or on a lazy Sunday, try this recipe, it really has extended my culinary horizon. Sift the chestnut flour into a large bowl - don't skip this step, the cake will not turn out well if the flour is clumpy! Add a generous pinch of fine salt to the flour. Using a wire whisk, slowly add the water to the flour, whisking constantly, until you have a very liquid, even batter. Drain the raisins and add about 3/4 of them to the batter, reserve the rest. Add about 3/4 of the pine nuts and chopped walnuts to the batter, too. 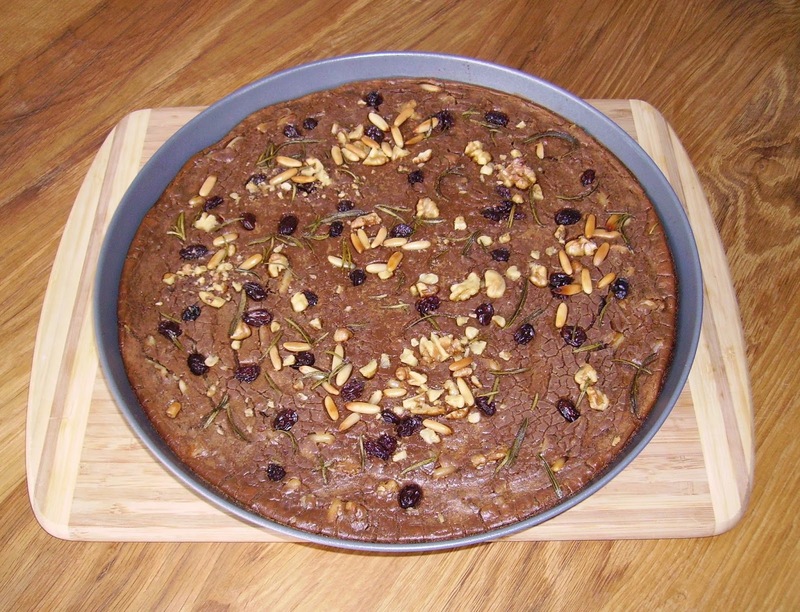 Drizzle 4 tablespoons of the olive oil over the surface of the cake and try to cover it as completely as possible. 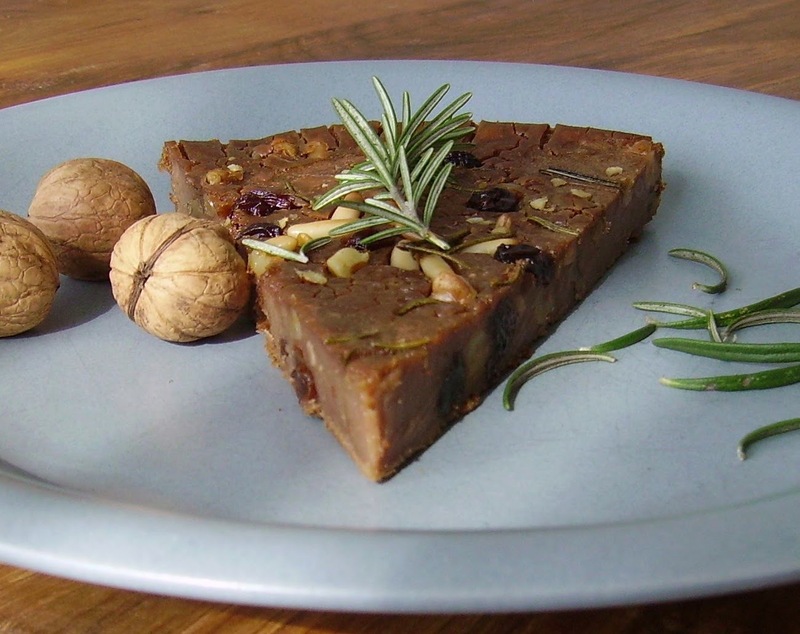 Sprinkle rosemary leaves from the fresh sprig, reserved raisins, pine nuts and walnuts on top and drizzle with the remaining 2 tablespoons olive oil. Put on the middle rack of the oven and bake for about 30 minutes or until the surface has the appearance of a cracked crust and is golden brown. Let cool and serve with honey drizzled over it, or with ricotta, parmesan or pecorino cheese. Have you ever tried hot roasted sweet chestnuts? I loved the cake very much! I confess I ate it as it was during the day as we were working in the garden. The natural sweetness of the chestnuts plus the sweetness from the raising were enough for me I did not need for. I loved the cake so much that I had to go to take one more piece again and again. Chestnuts were in the past an important source of food this especially in winter. In order to preserve them, chestnuts were dried and smoked the prevent worms attacks. 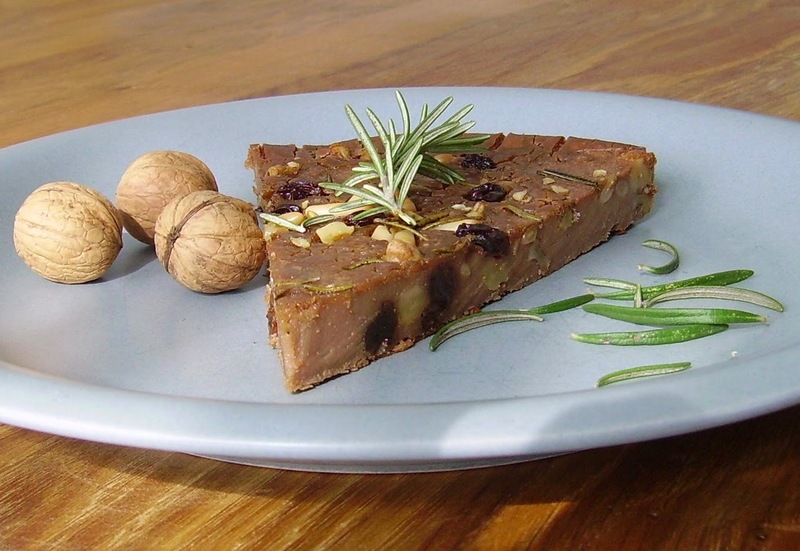 Thanks a lot for posting this great recipe and promoting traditional food. Thank you so much for making this recipe! I'm so happy that you liked it. Yes, it's so good, I had to freeze it to keep me from eating up the whole cake in one setting. As much as I love fancy new recipes, I still prefer traditional recipes to most other things.